SCVHistory.com LW2948 | Tejon Pass | Christo's The Umbrellas Japan-USA (California Site), 1991. 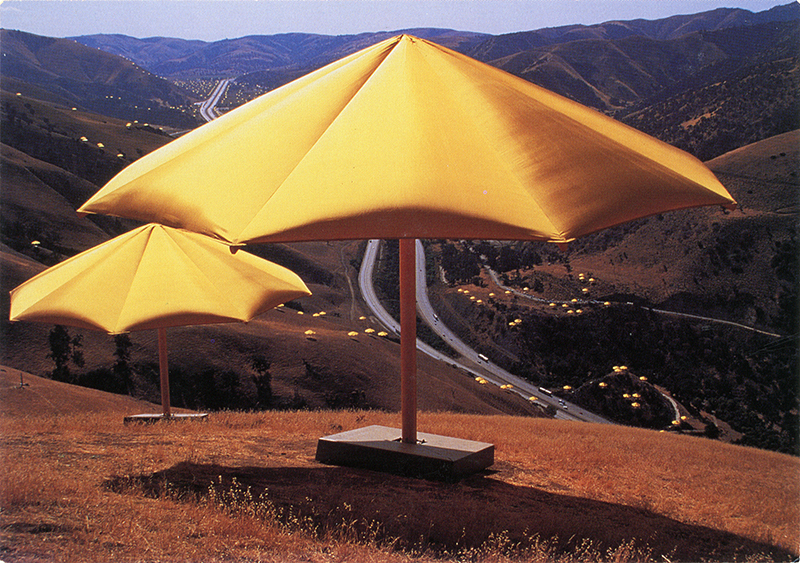 Christo and Jeanne-Claude's "The Umbrellas Japan-USA" installation (California site, Tejon Pass), 1991. Color postcards, 4x6 inches. Bulgarian environmental artist Christo (Christo Vladimirov Javacheff) and his Casablanca-born wife Jeanne-Claude have created outdoor public art all over the world. 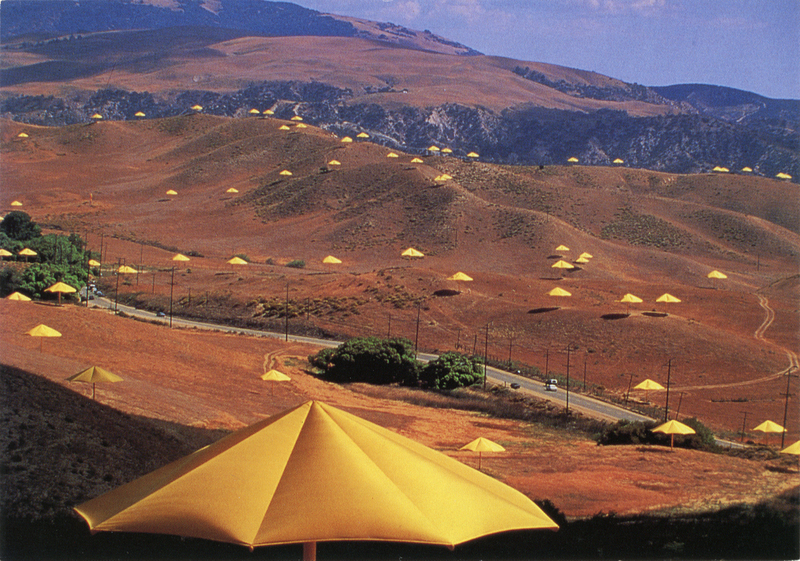 In 1991 they unfolded "The Umbrellas Japan-USA," a temporary, bicontinental installation of 3,100 umbrellas in California and Japan. 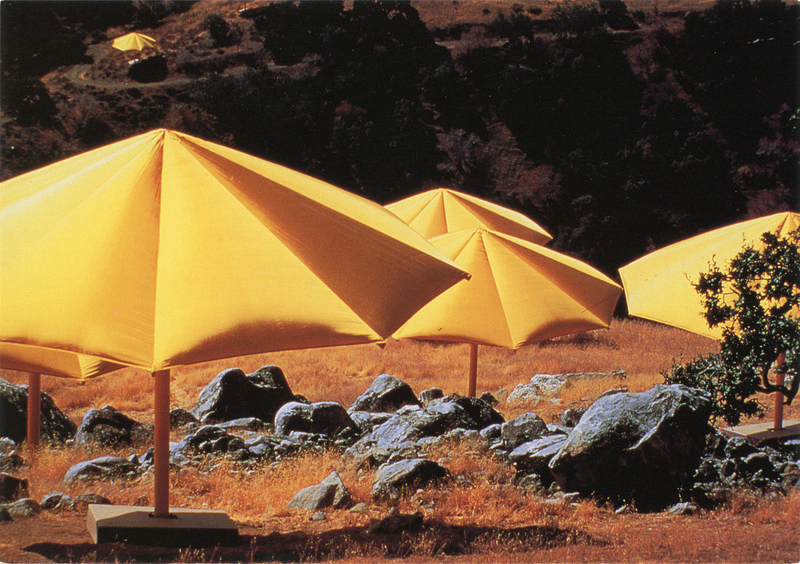 All fabricated in Bakersfield, 1,340 huge blue umbrellas were shipped to Ibaraki, 75 miles north of Tokyo, while 1,760 California golden poppy-colored umbrellas were installed by A.L. Huber & Son along an 18-mile stretch of mountainsides in the Tejon Pass from Gorman on the south to Grapevine on the north. Each measuring 19'8" tall and 28'5" in diameter and weighing 485 pounds, the umbrellas consisted of fabric stretched around an aluminum superstructure with a steel-frame base. The project cost $26 million and was entirely self-financed by the artists. Installation of the bases began in December 1990. In California, it took the cooperation of more than two dozen landowners including Tejon Ranch Co. and government agencies. Using helicopters and nearly 2,000 people (960 in California, 920 in Japan), the umbrellas were placed on the bases in September and October 1991. Their opening on Oct. 9 was a spectacle that was intended to last just 21 days but was cut short after 18 days. On Oct. 26 in the notoriously windy Tejon Pass, a 33-year-old spectator, Lori Mae Matthew of Camarillo, was killed when high winds ripped an umbrella from its mooring and blew it across a road, crushing her against a boulder and injuring several other people. Christo ordered the installation in both locations to be closed immediately "out of respect to her memory," his statement said. Disassembly began Oct. 27 and was equally deadly. On Oct. 31, crane operator Masaaki Nakamura, 51, was electrocuted when his machine's arm hit a high-tension line while he was helping to remove umbrellas in Japan. The land was returned to its original condition, and most elements of the umbrellas were recycled, the artists said. Christo and Jeanne-Claude were born the same day (June 13, 1935). Jeanne-Claude died in 2009. As of 2017, Christo was still making spectacular outdoor art throughout the world. LW2948: 9600 dpi jpeg from original postcards purchased 2017 by Leon Worden.